Weddings, Meetings, Lectures, Parties & more. We are ready for your next special event. The SeanSteen Chapel & Banquet Hall is the ideal venue for your next distinctive gathering. 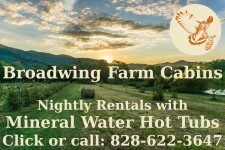 Located in beautiful, downtown, historic Hot Springs along the banks of Spring Creek. Our stone-built, classic, country chapel is able to seat 120 guests. Built by the local Methodist community in 1950, the chapel remains little changed from those bygone days. Traditional pews; original colored glass windows, milk-glass hanging lamps; and rare, wormy chestnut-clad walls and cathedral ceiling. Today the space is climate-controlled for your comfort. A Groomsmen's Room and Bridal Dressing Room help facilitate your wedding day. A covered walkway shelters you on the way to the spacious Banquet Hall next door. The space includes a brick floor dining hall, restrooms, and commercial kitchen.